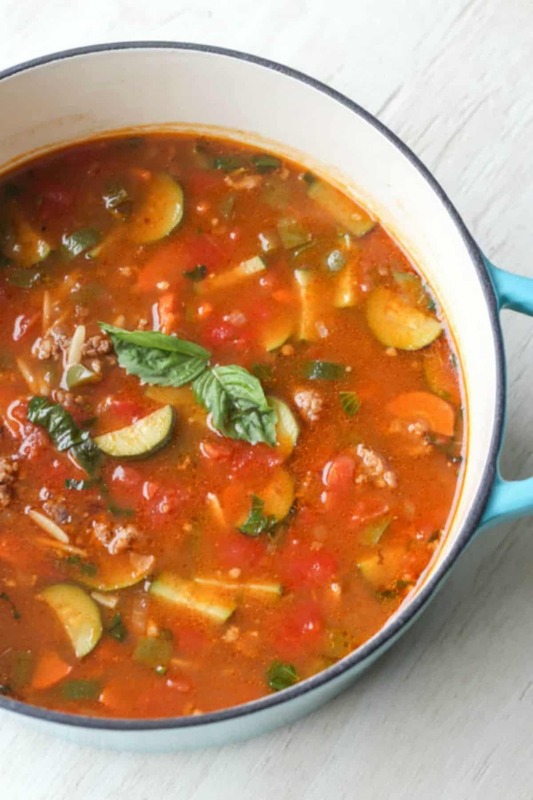 Italian Sausage, Orzo and Vegetable Soup recipe is filled with many unique flavors that will leave your taste buds satisfied. A mixture of vegetables, sausage, and orzo. Not your ordinary soup but definitely satisfying. It’s soup weather and I’m excited. I cannot wait to share some of the favorite soups we enjoy. We will begin with this healthy and unique soup. It’s unfortunate my children don’t like vegetables, boohoo, so this is not a soup they will eat. However, the Mr. and I just absolutely love it. He must have meat in his soups (don’t ask why, I don’t have an answer;).) so he is satisfied with the Italian sausage. 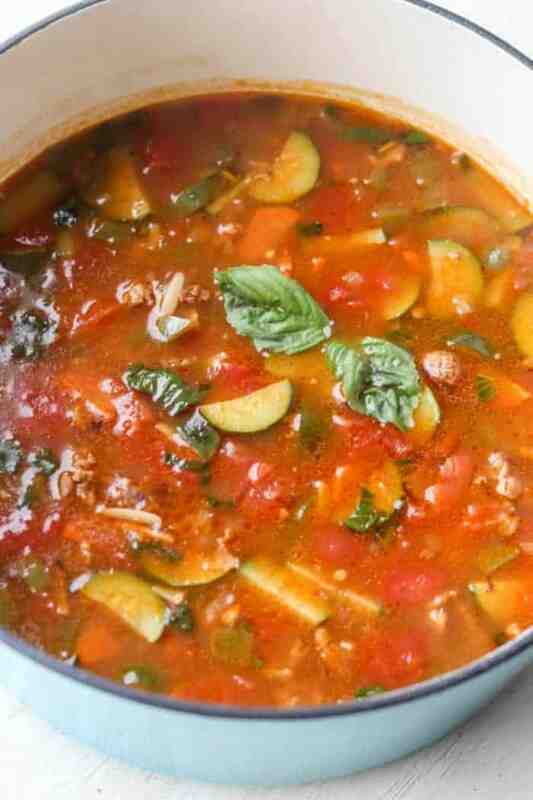 I love the flavor the zucchini gives the soup; orzo is just perfect here. I love the texture of orzo. It’s a taste between rice and pasta, so delish. If you have never tried it, oh do try, you will love it. I have to say that this soup has to be one of my favorites. If you have any zucchini left after finishing the soup, try this Zucchini Banana Chocolate Chip Bread for dessert! 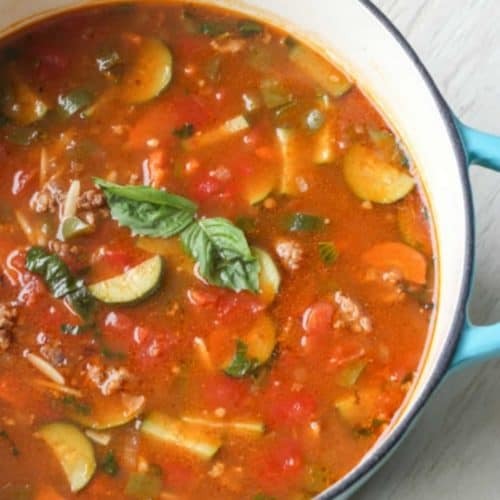 Enjoy this soup with the Russian Bread. Some of the other soups we enjoy are Creamy Chicken and Potato Soup, Meatball and Rice Soup and Russian Solyanka. Chop onion, cut the carrot in half and slice thin, and cube pepper; set aside. Remove casing from the sausage. In a Dutch oven, cook the sausage over high heat with 2 tsp oil until sausage is no longer pink, breaking meat up as it’s cooked (4-6 minutes). Remove sausage from Dutch oven, set aside. On med/high heat, add 2 tsp oil, onion, carrots, and pepper to the Dutch oven; cook until vegetables are tender, 5-6 minutes. Add the Italian sausage back, diced tomatoes, beef and vegetable broth, water, salt and pepper; bring to a soft boil. Add orzo, zucchini and stir. Cook uncovered 10-12 minutes until zucchini and orzo are tender. Stir several times so the orzo doesn’t stick to the bottom. Turn off heat, add desired basil amount, parsley may be added as well. (Add more salt and pepper, if needed). Let the soup simmer few more minutes and dig in. Chop onion, cut carrot in half and slice thin, and cube pepper; set aside. Remove casing from the sausage. In a Dutch oven, cook the sausage on high heat with 2 tsp oil until sausage is no longer pink, breaking meat up as it’s cooked (4-6 minutes). Remove sausage from Dutch oven, set aside. On med/high heat, add 2 tsp oil, onion, carrots and pepper to the Dutch oven; cook until vegetables are tender, 5-6 minutes. Add the Italian sausage back, diced tomatoes, beef and vegetable broth, water, salt and pepper; bring to a soft boil. Victoria, I’m so glad to hear this wonderful feedback, thank you for sharing ! :) Sure is super easy and I love the uniqueness of it:).. I want to make it, but we don’t eat pork, so I was wondering, what would the equivalent of those 3 Italian sausages be in pounds, so I could use some ground meat with Italian seasoning? Hi Juliana, I must say, I LOVE your name. Absolutely beautiful. It’s about 3/4 pound meat. You can even do up to 1 lb if you want it really meaty:). So glad to hear that Yelena. Haha “floating cucumbers” love it. My kids don’t like it either. More for the Mr. and I.. I made this soup couple days ago. It was simple and easy to make, my family liked it a lot. Thank you for posting it. Beautiful pictures!!!! Looks so simple to make and very delicious! Thank you!